Future pro Ralph Macchio grapes about the unstable creative crew, and the editors respond proudly that Englehart and Trimpe are "back together permanently." 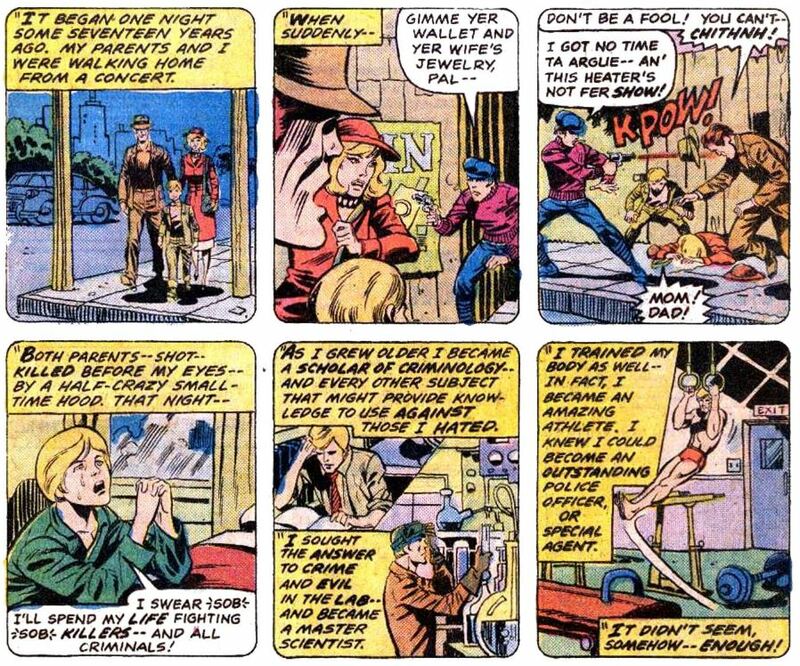 William Nutt complains about getting Bill Mantlo instead of the promised Englehart in issue 4; the editors shrug it off and encourage focusing on the future. Mark Long wants to see this become a rotating team-up book like MTU (this was likely a very common desire among the readers), but since the creative crew clearly doesn't want to do that, he encourages better scripting. He also wants Fu Manchu. The response: Englehart plans to use Fu as a guest in another of his comics, not this one. Did this happen? I don't remember Fu Manchu cropping up outside of Master of Kung Fu. They also don't rule out bringing in other villains to co-star, but currently "we really dig Doc and Subby." They admit they don't want to fall back into the "my ally/my enemy trip" that brought previous stories repeatedly back to the same point. They think the new direction will avoid that. I appreciate you sharing details about the letters page (you are taking to a letters page addict here!). I wasn't around when these comics were published, but had I been, I'd have been one requesting it become a rotating team-up book. It gets back to my point about, and I am only semi-serious, false advertising. "Doc Doom & Subby Monthly" is what it should have been called. 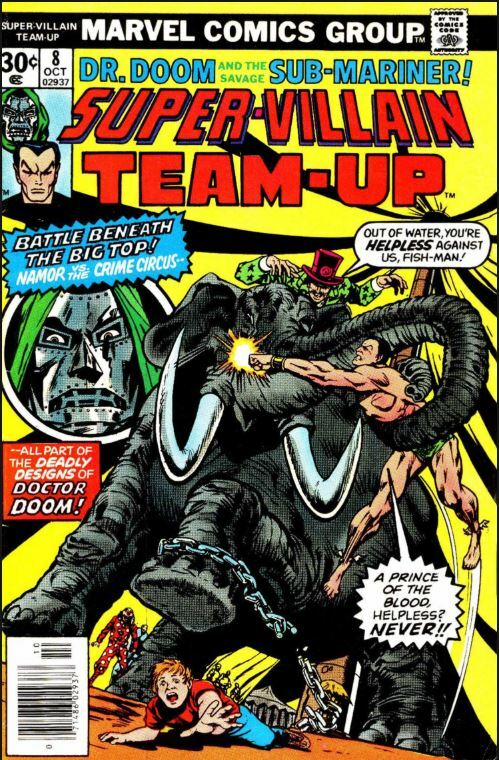 Super-Villain Team-Up is not what it was due to a) Namor not being a supervillain, and b) not showcasing a wider range of villain team-ups early on. I'd have loved to have seen standalone stories such as Kingpin/Green Goblin or Doom/Mandarin. Team-up is a precarious word for villains as they are more often than not manipulating each other or plotting something. From Doom's perspective, NO-ONE is teaming up with him, they are working FOR HIM. But that aside, some variety would have been preferable. The fact that it was probably a common desire among readers, and no doubt many such letters were sent, says it all. I'm sure the desire for issue-to-issue continuity was a driver steering them away from one-shot team-ups, since that's the one thing that has been consistent through its run to this point. Marvel Team-Up was the only mainstream Marvel comic I can think of at this time that was frequently "done in one", and none of the super-villain options were going to have the reader appeal that Spider-Man had. But Marvel Two-In-One would be a good model, and as we shall see, SVTU would turn in that direction, trying a focus on Dr. Doom, with a background thread linking the run, with rotating guest villains slotted in as co-stars. It could be that they figured Doom had the greater appeal, or that they were trying to find a way to return Namor to solo status, or that they were as uneasy at labeling Namor a super-villain as some readers were. That... that was not the surprise guest star I was expecting. I remember Fu Manchu appearing once outside of Master of Kung Fu. It was an issue of Iron Man during the Super-Villain War and it was just one panel. One of the participating villains (I think it was Modok) was listening to his agents reporting on what the other villains were doing. And there was a series of three one-panel flashbacks with each villain telling the Black Lama to take his globe and stuff it. I think it was Dr. Doom, the Red Skull and Fu Manchu. The FF depart Castle Doom, where the two doctors (Doom and Kissinger) continue to discuss the non-aggression pact. Johnny and Ben object, but Reed insists on obeying the government official, noting that the FF has had the confidence of every president from Kennedy to Ford (they weren’t afraid to establish real world timelines back then, but the FF were a mere 14 or so years old at the time!). The Shroud caps off his training with a stint in the Cult of Kali, in the Himalayas, where his initiation concludes in the “kiss of Kali”, blinding him, but leaving him with some sort of mystical sight that works in light or darkness. The Shroud’s goal is to kill Dr. Doom, to make his name as a superhero. While Namor is skeptical, The Shroud promises to do the deed before dawn. The lass Gretchen escapes Doom’s unwelcome advances thanks to the intrusion of The Shroud, who is able to counter Doom’s every attack with the help of gimmicks like his “bomb-a-rang”. In open defiance of his government’s peace treaty, The Shroud heats Doom’s armor with a magnesium bomb. When Doom sheds his chest plate, he is attacked by his own wolves who drive him over a cliff. The Shroud returns to Namor, declaring Doom dead, and setting the Sub-Mariner free. Free, however, with no further access to Doom’s antidote which had been restoring his air-breathing abilities. So the plan is to return to Reed Richards, who was already close on a solution to Namor’s problem a couple of issues ago. Is Doom really dead? Of course not…he awakens to find that he has somehow been taken to Hydrobase, where the Atlanteans had rescued him from the bottom of a Latverian river. The tables have turned, and Doom is now the captive! In the letters page, there’s praise for The Shroud and the new team, including Herb Trimpe. Alas, the editors inform us—Happy Herbie is on his way out, to be replaced by Jim Starlin and Steve Leialoha! Well, that was the plan, but don’t anybody get your hopes up, because (spoiler) it ain’t gonna happen. K. J. Robbins was praying for the book to be cancelled (that’s a little harsh!) 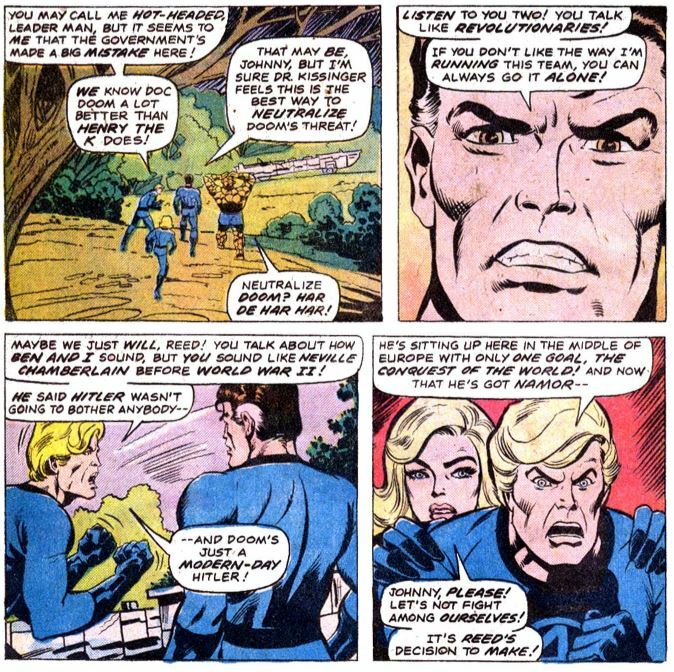 until Englehart came to the rescue, and Ralph Macchio returns to the page to ask for a resolution to the dangling Hydrobase subplots. Coming right up, Ralph! First of note, Henry Kissinger is identified by name this time around, which is a little surprising. Usually the comics of the era were a little more coy with real life characters, especially when clear political criticism is intended. Reed comes off as the voice of the conservative establishment, Johnny and Ben as the left, and Sue as the moderate. But Reed’s side trip to Hydrobase suggests that maybe he’s not as compliant as he seems. We’ll have to wait and see, since his warning remains hidden from the reader. I don’t know what Englehart was thinking with The Shroud. 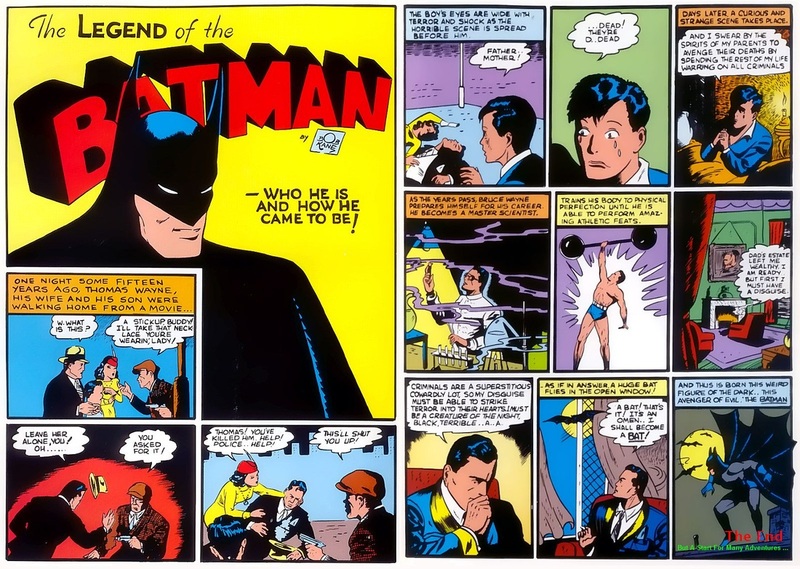 In those days, creator incentives weren’t in place, so introducing a blatant Batman impersonator who couldn’t be capitalized on as well outside of the comics might not have seemed a big deal, but it’s still a waste of a pretty cool character name, which aren’t that easy to come by. Could he have considered this some kind of audition for the real thing, which he would soon be tackling to great acclaim? That seems unlikely. I have to assume he just wanted to write Batman vs. Dr. Doom, and this was the only way it was likely to ever happen, so far as he knew. Or, perhaps it’s a commentary on the unlikelihood that will power and dedication could forge a hero capable of taking on the biggest of the bads? No, the Batman of that era wasn’t the unbeatable Dark Knight that he was yet to become..and besides, The Shroud does in fact take down Doom pretty handily (although it’s unclear whether the wolf attack was something The Shroud caused or just a lucky break). And while The Shroud was suggested in earlier issues to have some particular beef with Doom that suggested an intertwined back story, we find out instead that he simply wants to take on Doom in order to establish his reputation as one of the top-string superheroes. That’s a bit disappointing, and unconvincing. You can’t argue with results, though, and even if he did get a lucky break, he was handling Doom with as much success as any of Doom’s opponents, so maybe it was a good plan after all. Trimpe, now teamed with yet another inker, delivers another satisfying set of pages—nothing really spectacular, but lively and bold. Doom’s behavior with Gretchen is pretty shocking from modern perspectives, and I think most would agree it’s wildly out of character for Doom to use his authority for sexual assault. Pretty icky stuff, even if our new hero interrupts Doom’s unfinished threat: “The hounds know their master! And you, Gretchen! Do you know—” Evidently, Englehart was setting up the wolves turning on Doom, just as Gretchen would have had she seen the opportunity. So I have to assume now that The Shroud didn’t have anything to do with their attack, after all. I recall that Weiss was once on tap to do a Sub-Mariner revival series that never came about, which is too bad--he'd have been terrific. Weiss had earlier drawn a nice Namor six-pager in Sub-Mariner #54. Was the Shroud a blatant Batman imitator? It's not like Batman was particularly original when he was invented. He's the most prominent representative of the low-powered hero type, but Batman is also one out of a kajillion. 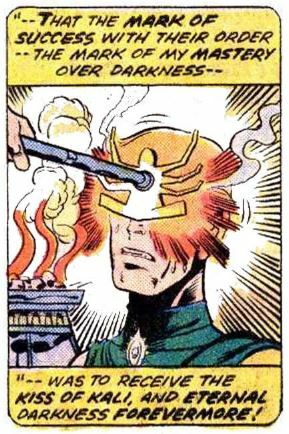 If anything, the "blind" part of the Shroud's origin puts him closer to Daredevil, while personality-wise and name-wise the Shroud feels closest to the Shadow. Your memory is spot on. It was in Iron Man #74. Steve Englehart says on his website that he provided uncredited co-plotting on IM #73-75, 77, 80 & 81. Makes you wonder what Englehart had in mind for the character down the road, if anything - Marvel's Batman? Batman done right? a critical look at the DC character? or just a one-off, a fun riff on a famous comic-book icon? I didn't mind the Shroud but at the same time he never made a big impression. But I remember hardly any details about him at this point. Oh, okay. I've read this comic 4-5 times and totally forgot the origin parallelism. Still the Shroud never felt particularly Batman-esque to me. Neither did Nighthawk or Moon Knight, come to think of it. 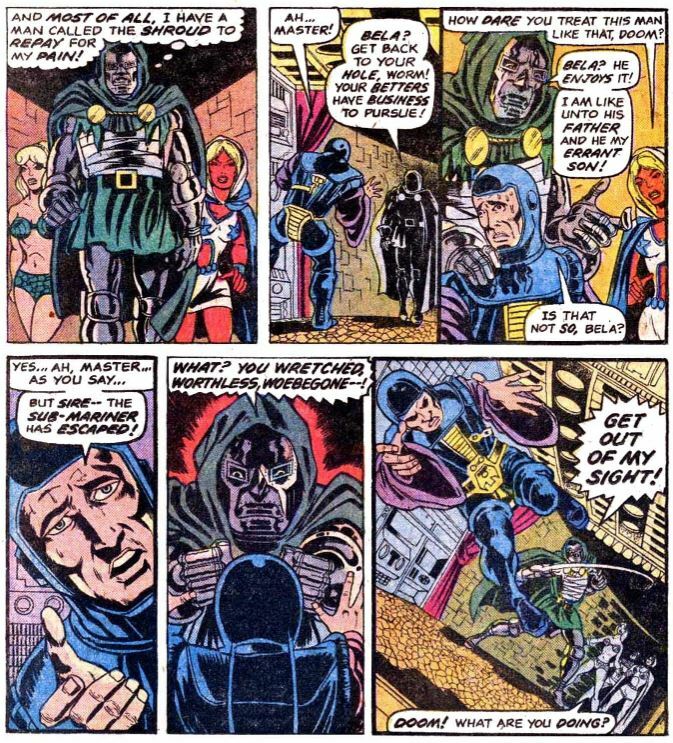 Steve Englehart's website says, "But totally related was my creation of the Shroud in #6, to be a third force somewhere between the villains and the heroes. He was a combination of the Shadow and the Batman, both favorites of mine, and since I was a Marvel writer I was never going to get a chance at the real Batman..."
Over in the Avengers at this time, Englehart was using the Squadron Supreme to critique the JLA in "20,000 Leagues Under Justice". I think Batman's counterpart, Nighthawk, was absent from that storyline for some reason. Glad that didn't turn out to be true. Mister Engelhart, meet Mr. Rogers and Mr. Austin. 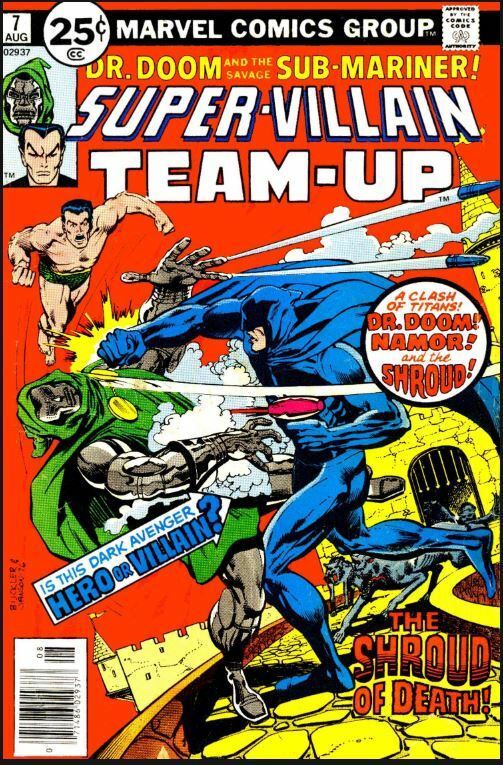 Cover is credited to Marie Severin, pencils and possible inks on GCD, but it looks like more diverse hands in addition to hers—Namor looks like someone either swiping or highly influenced by Gil Kane, possibly Klaus Janson. 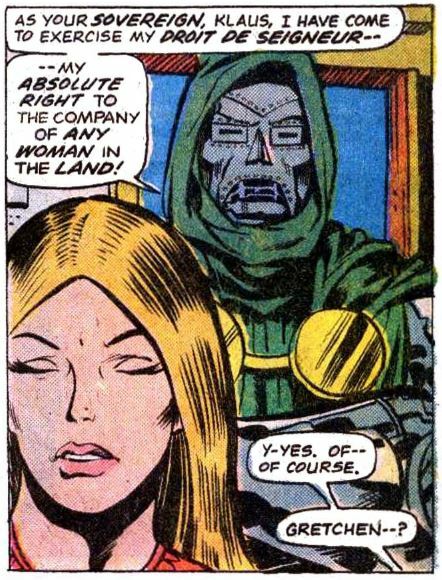 Doom tells his guests, though, that Namor is simply taking a “constitutional” in one of Latveria’s beautiful lakes! Nita has doubts, and keeps Doom under gunpoint—without his chestplate, a bullet through the heart would kill even the master of menace. The pair escape the mob by crossing and cutting a rope bridge across a ravine. Meanwhile, Doom is at Hydrobase, supposedly preparing the cure in their impressive lab, but actually plotting “Plan Gamma” via radio to his faithful manservant Boris. Namor’s out, Shroud’s faced with the Latverian police, and Doom (or is it really Doom?) has him on the spot! Another editor takes over—the legendary Archie Goodwin! 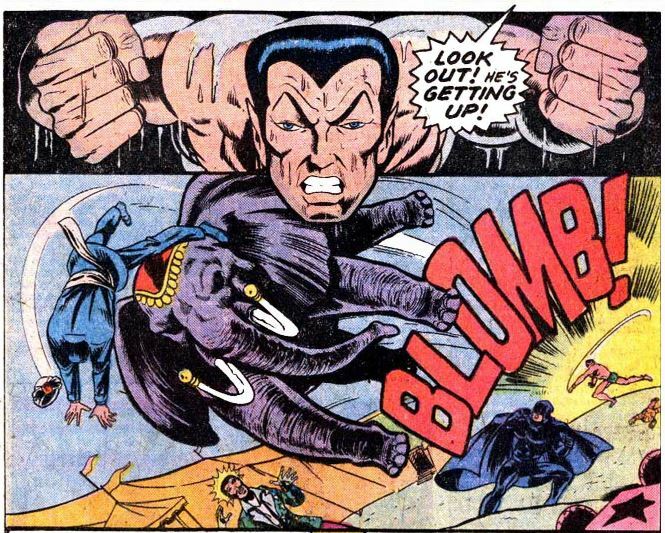 Namor gets the spotlight this time around, and Englehart delivers some engaging developments. We see the glimmer of a resolution to the Hydro-Men plotline, and finally get something a little more akin to the “guest villain” co-stars that readers have been asking for. Yeah, we had Attuma, Tiger-Shark, and Dorcas, but that felt like Sub-Mariner cast members. 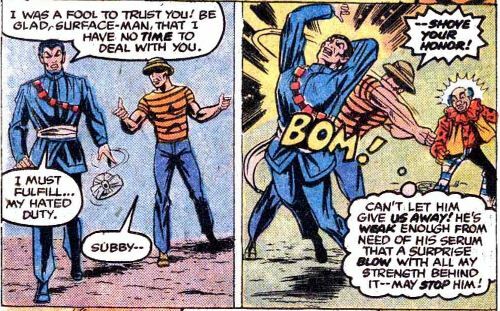 The Circus of Crime, as Namor notes, are a crew that he hasn’t encountered before, and they do sort of team up here. Although the Circus aren’t really villains here, but a legitimate troupe of entertainers. Englehart’s a lot more deft with reversals of situations than his predecessors on this title have been, but it’s still a hallmark of the series. Now, Doom’s the prisoner…now Namor’s free…now Namor’s giving himself back into slavery…now The Shroud turns on his partner to save them both. This was my favorite issue so far by a big margin. In the letters page, we learn that this will be the last issue for Steve Englehart, who’s leaving Marvel. (He’ll show up soon at rival DC, where he’ll make an impressive showing on both JLA and Detective Comics. Maybe The Shroud *was* an audition for Batman!) Plans are for Bill Mantlo and Bob Hall to be the new regular team, with a fill-in next time by Bob Brown. Brown, alas, will not be here for that job. He died around this time from leukemia; I don’t know if that was a factor in his not taking on this job, but it seems likely. The letters mostly laud the new direction, without comment from the editors. I'm almost surprised that Giffen was credited only with the layouts for this issue, because his style seems quite recognisable in these samples.